Last weekend I was fortunate enough to spend a night and a couple of days in the Vegan mecca that is Brighton! After having visited for the day back in February for Brighton VegFest I was keen to return to this wonderful seaside town for some further exploration of all things Vegan. Anyone who went to Brighton VegFest this year will know that the weather was pretty horrendous and we really didn't feel up for traipsing around in the rain so it was the perfect opportunity to book ourselves a little weekend away revisit for this Summer. After some scouting around online I found the perfect base for us at My Hotel Brighton. This very modern and funky hotel is situated in a perfect central location which made it easy to reach all the spots on my Vegan hit list! Everything seemed to be a 5 minute stroll away from us which was great as we were only there for a couple of days and we really wanted to be able to make the most of it. At only £75 for the night via Booking.Com it also seemed like a really good value deal for the peak Summer season. I have been to Brighton many times before for day trips and events but until now I have never had the time to fully explore it in all its glory. Since going Vegan last year I kept hearing more and more about all the Vegan friendly restaurants and cafes which got me really excited to re-visit the area again. When we arrived on Sunday it was great to just initially stroll about in the sunshine and explore all the quirky shopping lanes and get our bearings. 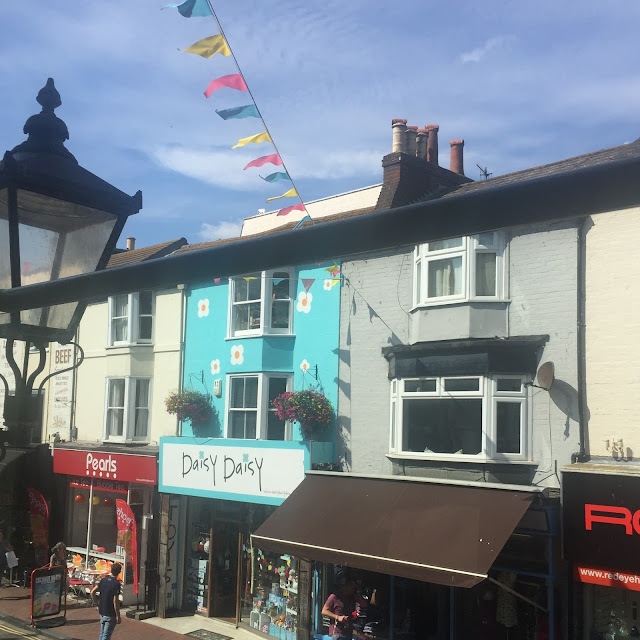 The shopping in Brighton is really fantastic and, aside from all the mainstream high street shops you would expect to see, there's also countless independent shops selling everything from clothing, antiques, homewares and gifts. There's also a really great second hand and vintage scene if you enjoy looking for some real bargains. I think it's fair to say that I could have spent a small fortune on shopping alone! One of the first things I said to my husband was that we are definitely coming back in November to do all of our Christmas shopping there! With bunting lining the shopping lanes and street art on every corner, Brighton really is a colourful and vibrant place to be. It's so much fun to walk around and take everything in as everything you see is highly Instagramable! I think it's fair to say I went a little photo crazy this weekend and my Instagram was probably the busiest its ever been! As soon as we had our preliminary walk around it was time to start ticking things off my Vegan hit list. 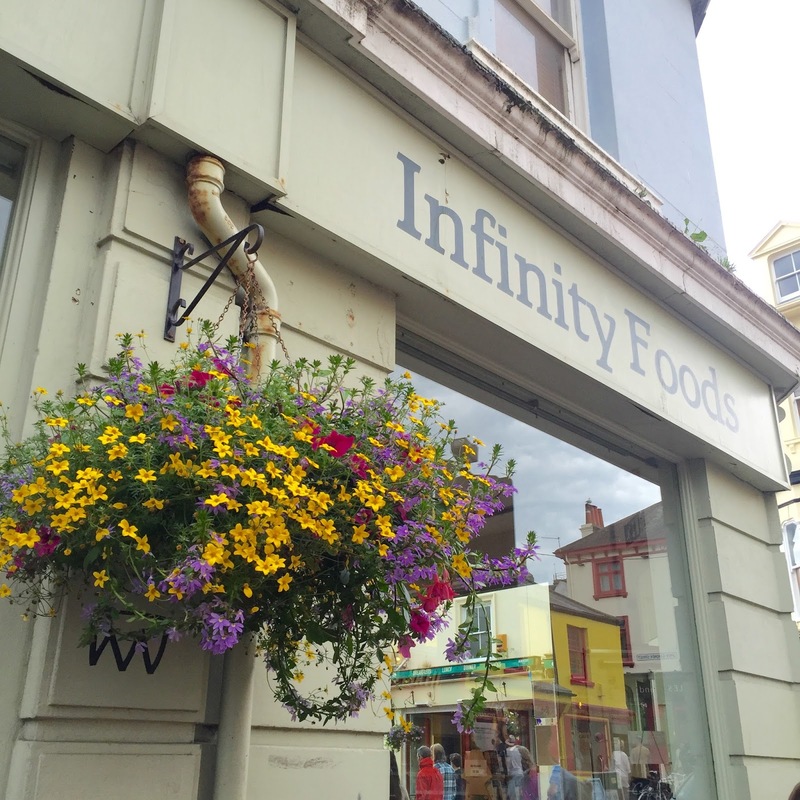 Our first stop on the list was the Infinity Foods shop which if you've never been to is like a mini health foods supermarket. I seriously felt like a child in a sweet shop in here! It was amazing and I began to dream about what it must be like to have a shop of this kind on your doorstep. Wishful thinking! Unless I move to Brighton of course... But a quick glance over Right Move is quite telling as to what kind of premium you have to pay to have such luxuries in close proximity. My jaw dropped when I saw the selection of Vegan baked goods on offer. There was everything from Vegan scones, flapjacks, sausage rolls, pizza's and bread. It was like stepping into heaven! Even though we had no idea when we would eat them, we simply couldn't resist picking up a few items to take away with us including this incredible chelsea bun which we later enjoyed back at the hotel with a cuppa. And yes it was as amazing as it looks! After a lot more walking around and further exploration we had built up our appetite for lunch and it was time to visit my selected award winning cafe Idyea. I have to say that we nearly got de-toured on our way there by passing the Indian Vegetarian/Vegan buffet restaurant Bombay Aloo which looked simply amazing and although I could have been tempted in I was also keen to stick to what I had planned out to see and do. Bombay Aloo is now on my second hit list for when we return to Brighton as sadly for us there simply wasn't enough time to try everywhere. Anyway, getting back to Idyea - this place really should feature on your places to visit if you're in the area. I had heard some really good things about their buffet style lunches and couldn't wait to get inside to see what was on offer. We visited the Kensington Gardens cafe as it was central to where we were staying and the shopping areas and I am glad we did as it was a really lovely place to stop for lunch. The selection was vast and works by you choosing one main dish along with two sides and two toppings. It took us ages to decide what we wanted as it all looked so great. As you can see from the photos below our plates look like a bit of a mess but it was a delicious mess! I opted for the Vegan lasagne with some roast potatoes, salad, beetroot and garlic dressing. 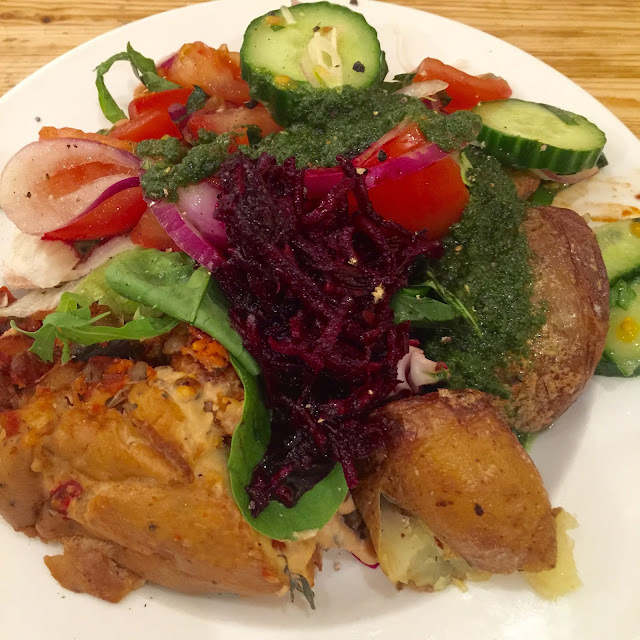 My husband opted for the Vegetarian enchilada with roast potatoes, carrots, salad and hummus. For both our buffet plates and two drinks it came to around £18 which we thought was really reasonable and we both thoroughly enjoyed our dishes. This is definitely a great lunch spot as it's pretty laid back and casual with mostly bench style seating. I would definitely come back here again when i'm next in Brighton. After lunch it was time to get walking again and we decided to take a stroll down to the beach front. Unfortunately by this point the weather had clouded over a bit so we didn't really fancy sitting on the beach but it was still good to have a walk along the front and see what the pier had to offer whilst also taking in more of the shops. After many recommendations I had decided a long time ago that our spot for dinner that night would be Food For Friends. I had heard so many good things and that it was a lovely place for dinner. As we wanted to dress up a little and have a 'date night' this seemed like the perfect place for us so I booked us a table to secure it as our dinner destination. I was pleasantly surprised when we walked into the restaurant as some reviews had me believing it was quite posh but in my opinion it's just a really nice restaurant and even though we had dressed up for the night many people inside were actually pretty casual so I think this is a good spot for any occasion. For our starters we opted to share some Vegan 'Portobello Rolls' which were really delicious but there just wasn't really enough of them for two people to share (depending on how hungry you are!). I was pretty surprised by how posh this dish looked when it arrived and it made me realise that Food For Friends is clearly a step above the rest in their culinary style. I was informed that one of the mains which I had my eye on had sold out which sadly then only left me with a couple of Vegan friendly options to choose from and I have to admit that I wasn't in the mood for either of them. I had a choice between an avocado salad or a roasted aubergine. I felt a bit let down as I had been really looking forward to this dinner but to be honest I don't know what I was really hoping for, there just seemed to be much more choice for Vegetarians than Vegans. He went for the Vegetarian haloumi and mushroom burger with chips. Now thats a dinner! 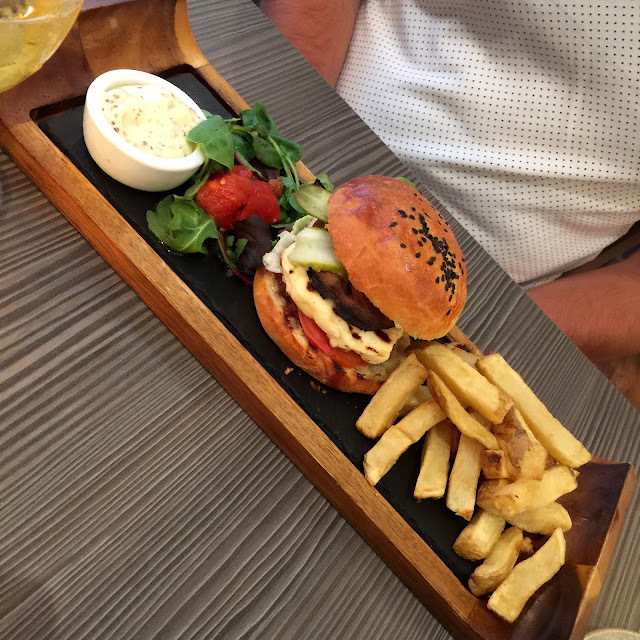 It looked pretty amazing and he was really pleased with his choice and claimed it to be one of the best burgers he'd ever had. It's a shame this burger couldn't be made Vegan friendly otherwise I think I would have gone for this as well. 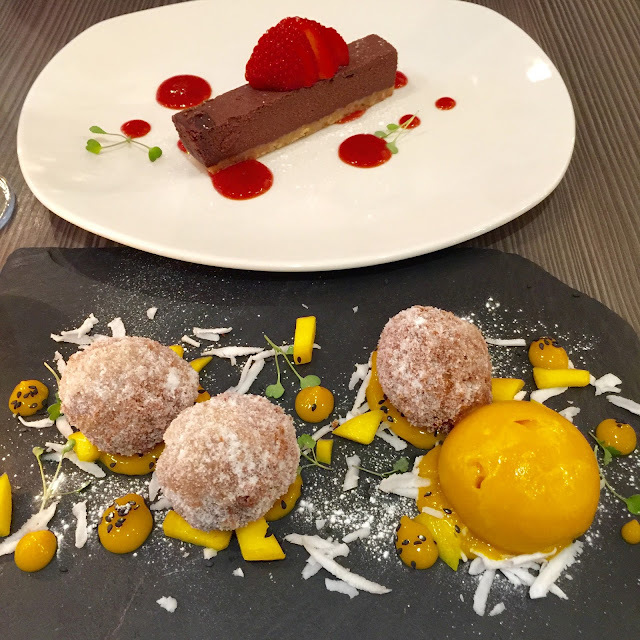 I don't often go for desserts anymore as I am becoming much more of a savoury kind of person but as I felt a tad disappointed with my main I still had room for pudding and for the sake of my blog review I wanted to try all three courses. That's how I justified it to myself anyway! For dessert we chose the Vegan coconut arancini balls and the chocolate torte. I was surprised by the dessert portion sizes as the starters had seemed a little small but this certainly made up for that! We shared both desserts and both were fabulous. The arancini were amazing and like nothing I have ever tried before. They were almost like a donut consistency with sticky coconut rice inside which worked amazingly well with the mango sorbet. The torte was very rich and indulgent but equally as nice. 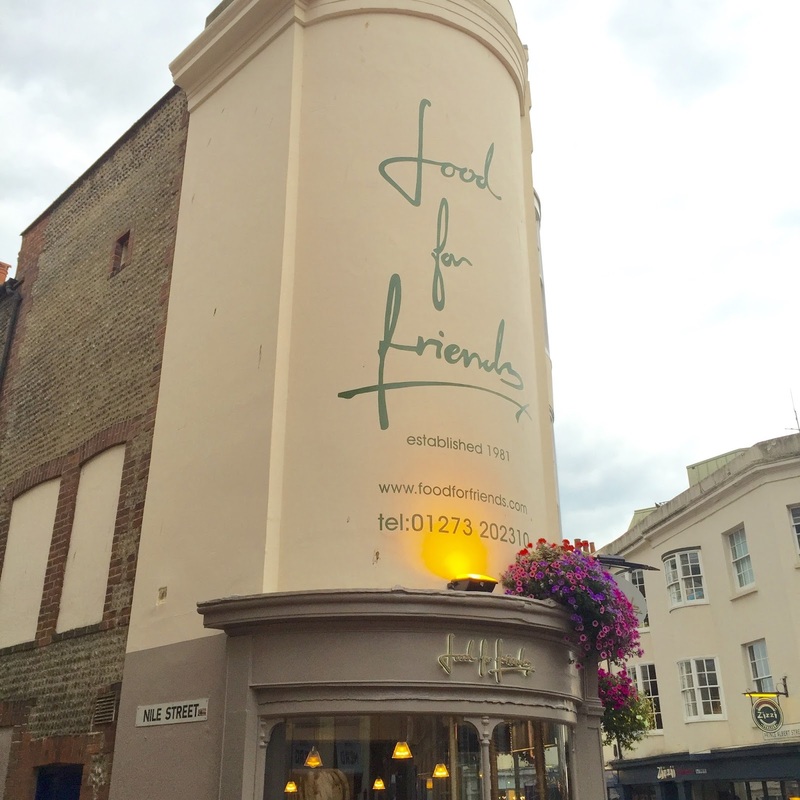 Overall we really enjoyed our meal out to Food For Friends and I can see why this is a top pick for when visiting Brighton. 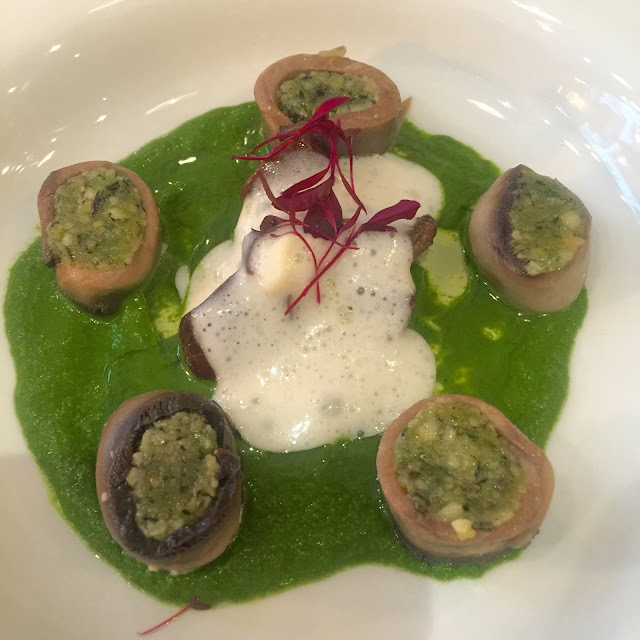 My only complaint would be that I would like to see more Vegan mains on the menu and if I was to visit again I think I would call ahead to hear the choices first. Our bill for all of this food and two alcoholic drinks was around £65 which I think was really fair for a dinner of this calibre. It maybe wouldn't be somewhere i'd visit every time but perfect for a special occasion or a night out where you're looking for something a little more special. We pretty much rolled back to the hotel after this meal feeling very stuffed and satisfied after an awesome first day and night in Brighton. The next morning we mooched around the shopping lanes a bit more and then headed for a late breakfast at the Infinity Foods Kitchen. 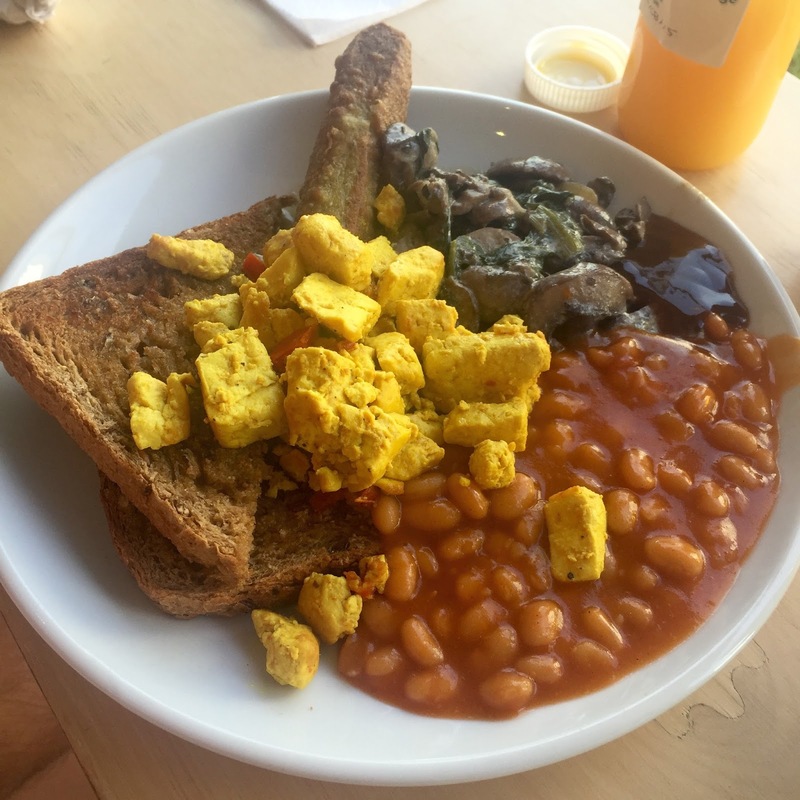 Again from my research I had discovered that this was a good spot for a Vegan breakfast and having passed it many times over the last 24 hours I was keen to get inside and try it out for myself. We sat upstairs and had a lovely view out over North Laine which was great for people watching. 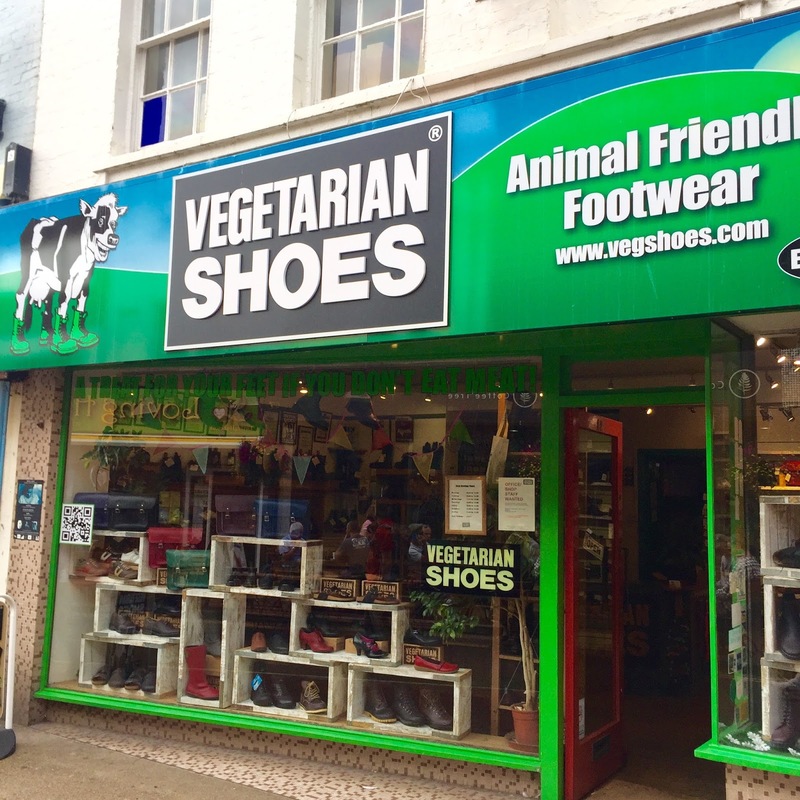 As we sat there my husband commented that there's not many places where you can be sat in a Vegan cafe with a Vegetarian shoe shop over the road and a health foods supermarket on the corner. He was totally right! And this made me realise that Brighton is a pretty unique place for all things veggie. I thought when we went to Berlin last year that it was extraordinarily good for Vegans but I really do think that Brighton is a very strong contender. In Berlin everything is very spaced out and maybe even a train ride away from each other, but in Brighton you can literally walk from place to place in minutes which is so appealing when visiting somewhere. 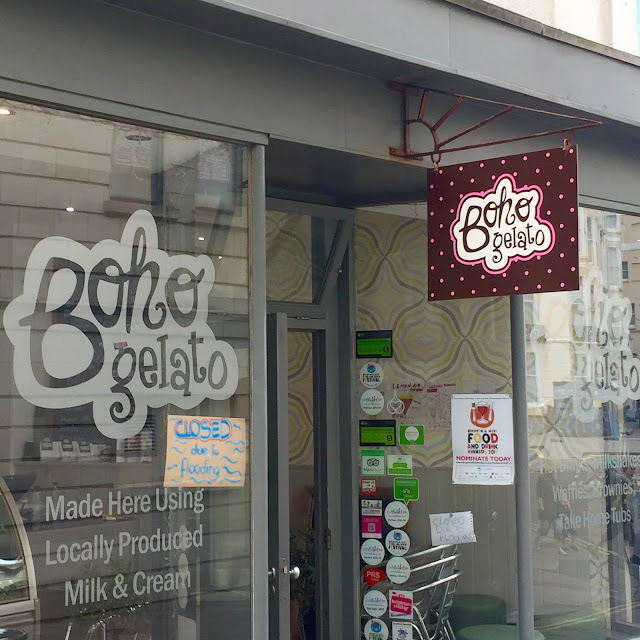 Brighton without fail has to be the Vegan capital of the UK! After all of that pondering and chat our breakfasts arrived and really hit the spot. I opted for beans on toast with mushrooms and spinach. My husband chose the mini breakfast which was pretty much similar but he had a Vegan sausage and tofu. Both breakfasts went down very well and were perfect for re-energising us for more walking around. 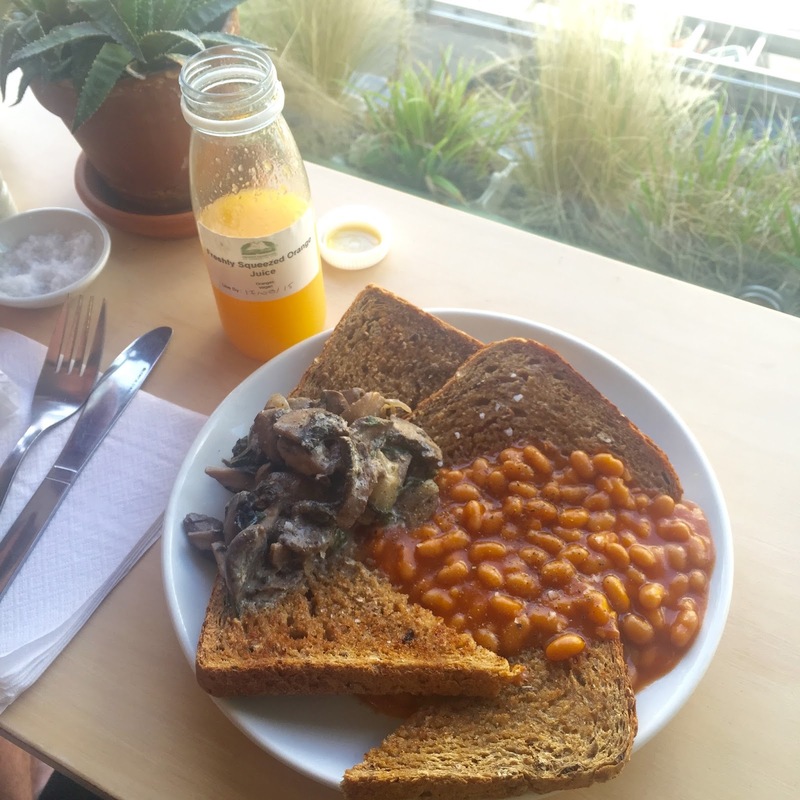 The Infinity Foods Kitchen is a lovely little laid back cafe perfect for breakfast, lunch or a day time pit stop. 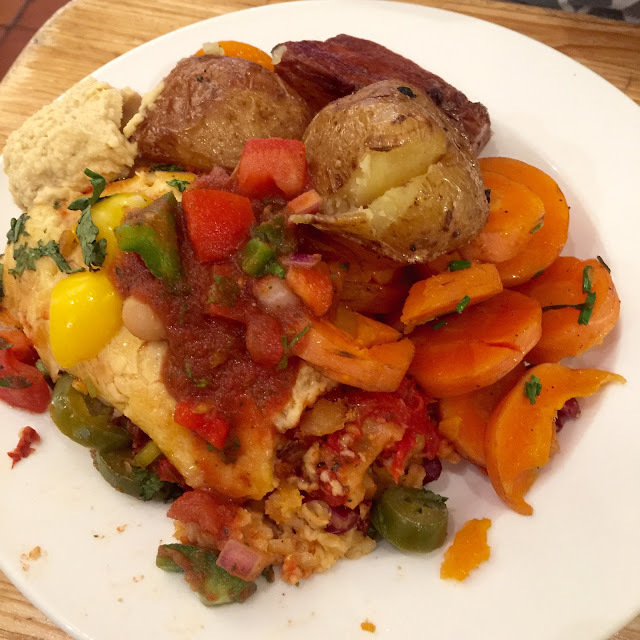 When ordering breakfast I noticed their infamous Vegan Snickers bar which looked incredible but I couldn't justify eating anymore so I sadly had to miss out this time. After breakfast the weather was amazing so we took a stroll around the Brighton Pavilion which is really worth going to look at as it's an amazing piece of architecture near the seafront. Unfortunately we didn't have time to fully explore but if you do then there is so much to do here in the way of museums and galleries. The park opposite is also beautiful for a stroll or a sunbathe. We couldn't leave Brighton without going for a walk along the pier. We knew there wouldn't really be much there for us but still it was worth a visit for the views and looking at all the retro fairground rides. This would be an absolute must if you have children as there is just so much to do there for them with all the rides and amusements. The final place on my Vegan hit list and before we made our way home was the ice cream shop Boho Gelato which I heard features some special Vegan ice creams. When we first walked past it was closed due to flooding so I didn't think I would get to try this but when we went back the next day it was thankfully reopen. Initially I didn't think they had any Vegan ice cream as it didn't seem to be advertised anywhere but when I asked the assistant he pointed to at least 6 ice creams which were indeed amazingly Vegan. I had been expecting maybe just some standard vanilla flavour but no they had everything from chocolate, peanut butter and mint choc chip! I'm so happy I got to try this ice cream as it was divine! A definite must visit if you're in Brighton and perfect on a hot sunny day. I'm so happy that I got to visit everywhere I had planned to on my Vegan hit list. However, what I wasn't expecting was to see so many other Vegan friendly places which I hadn't heard of or anticipated. I was gutted to not make it to Fil Fil for some falafel as this looked really good. We also passed by the Prince George Pub whose menu looked great for veggies. There's also the Indian buffet restaurant I mentioned earlier. And finally The Loving Hut which also looked very inviting. I also can't forget V Bites which is well worth checking out but we didn't visit this time as we already went back in February (you can check out my review here). I definitely plan to visit all of these new places the next time I am in Brighton. And judging by the length of my list I am thinking I had better book a week long stay! There really wasn't enough time in two days to experience everywhere I wanted to but in many ways I am happy because it is the perfect excuse for us to make a return visit. Brighton really is a Vegan & Vegetarian paradise and if you haven't yet been you're really missing out. It's the perfect seaside destination for a little weekend away and there really is something for everyone (even if you're not veggie!). Endless shops, bars, restaurants and shopping all along with its eclectic vibrancy and great beach. You really can't go wrong! Personally I can't wait to go back and I am already planning my return visit later this year. But for now it's back to the diet, the gym and reality! Well this post made me miss Brighton just a little (although I can hardly complain about being in Croatia!) 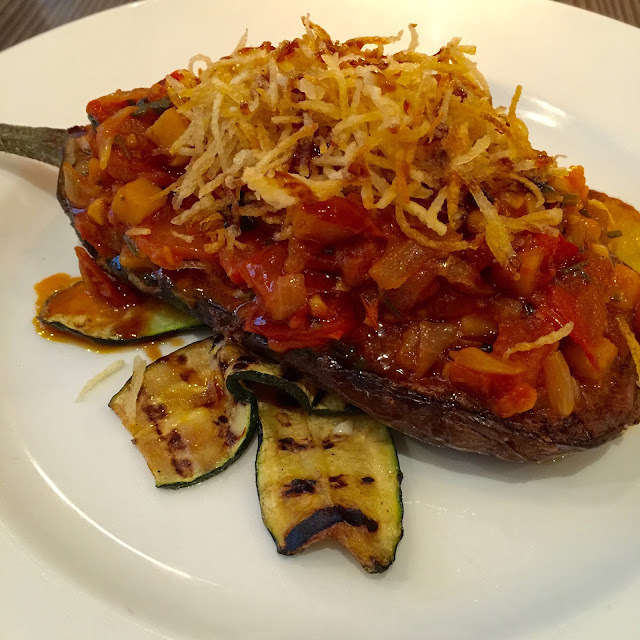 You hit up a tonne of my favourite places, Infinity Foods and Infinity Kitchen, Iydea, Boho Gelato but next time I would recommend Terre a Terre for your fancy date night meal, they're much more vegan friendly and the food is off the charts delicious. Oh my goodness Sarah! I had no idea Brighton was such a paradies for vegans! I've been there once, but many years ago and just for a day. Shame shame shame on me! I must definitely go back. I loved it, and I loved the pier and everything about the town, it was so colourful! I will go back and try all the places you mentioned. Thank you for this post! You woke up the traveller in me again lol!